At the time this article was published there were only 3 airlines flying the CRJ1000 aircraft around the world. Air France happens to be one of the airlines that are part of those 3 airlines. All Air France Bombardier CRJ1000 NextGen regional jets are operated by Air France's regional subsidiary called HOP!. Previously Air France CRJ1000 NextGen jets were operated by Brit Air, an Air France subsidiary. On March 31, 2013 Air France combined all of their regional operations into a new subsidiary called HOP!. Brit Air was one the 3 companies combined into this new entity. HOP! now operates all regional flights for Air France. On December 14, 2010 Air France/Brit Air took delivery of one of the first 2 CRJ1000 jets, with Air Nostrum also taking delivery of one of the jets. Air France has ordered 14 CRJ1000 jets and taken delivery of 13 CRJ1000s, according to Bombardier's December 31, 2012 program status report. 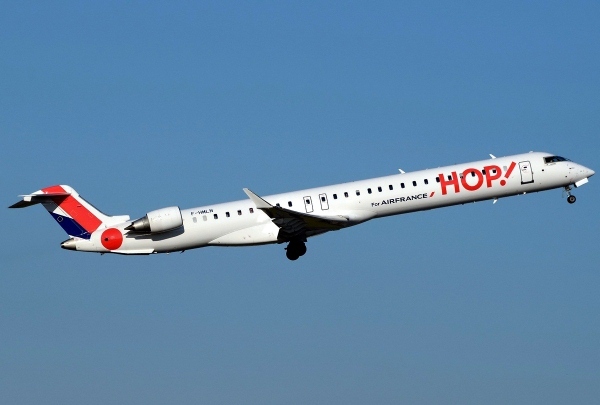 With Air France's new regional subsidiary, HOP!, the current Air France CRJ1000s will be painted in the new HOP! CRJ1000 livery that is show below. All Air France Bombardier CRJ1000 airplanes are fitted with 100 seats in a one class configuration. For more this configuration and to see the Air France CRJ1000 seat map – seating chart visit the CRJ 1000 seat map – seating chart page. Above Bombardier CRJ1000 HOP! Air France photo by Aldo Bidini on Wikimedia Commons. Photo (only) released under the GNU Free Documentation License, Version 1.2. An Air France Bombardier CRJ1000 is also called an Air France Bombardier CRJ1000 NextGen, Air France Bombardier CL-600-2E25, Air France Canadair CL-600-2E25, Air France Bombardier CRJX, Air France Bombardier CRK, Air France Canadair Regional Jet 1000 or the Air France Bombardier CRJ 1000 / Air France CRJ-1000 (with a space or a dash) due to the various names for the regional jet aircraft. To learn more about why the airplane has many different names visit the other pages about those names (coming soon).